Need a little energy boost before your run, fitness class or game? What mom doesn’t! Want a delicious NO BAKE energy bar that’s quick and easy to make that will help you get kick started? We’ve got it for you! Behold the “Lucy Bar”….an incredibly easy to make bar that only requires four…..yes FOUR ingredients! 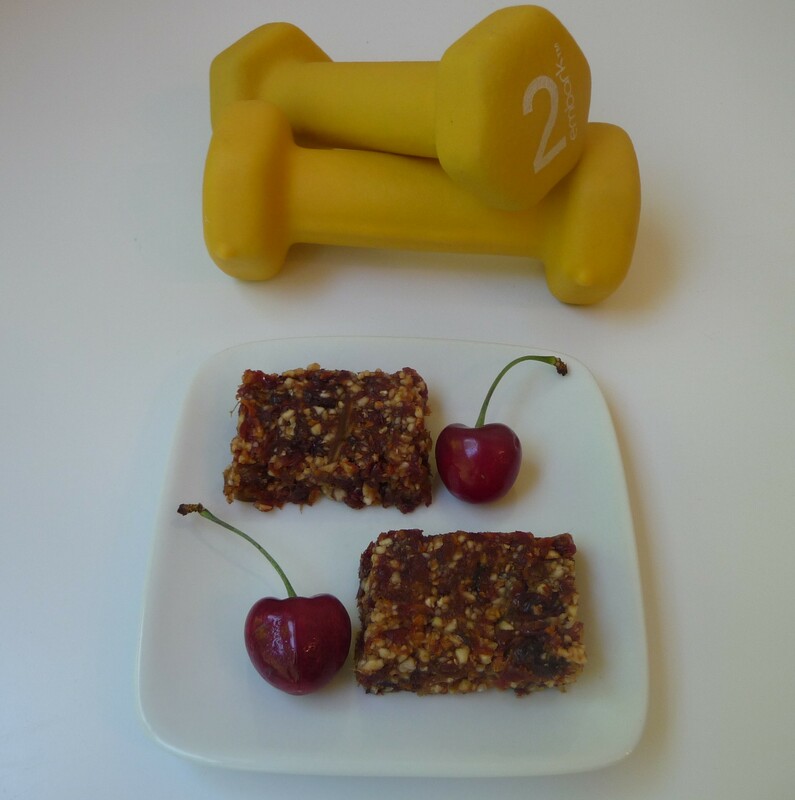 Based on the popular Lärabar- Cherry Pie bar found in stores, the Lucy Bar comes from the book Power Hungry: The Ultimate Energy Bar Cookbook by author Camilla V. Saulsbury and was featured in Women’s Health Magazine. These are perfect for making up a big batch at the beginning of the week to get you through all of your workouts and the DIY aspect lets you control the ingredients and portion sizes. Sounds Fantastic? Let’s whip up a batch now! Optional: Instead of cherries try your favorite dried fruit….get DIY creative! 2. Combine the cherries, dates, and warm water in a small bowl. Let stand for 5 to 10 minutes until the fruit is soft (time will vary according to the dryness of the fruit). Drain and pat dry. 4. Transfer the mixture to the prepared pan. Place a large piece of parchment paper, wax paper, or plastic wrap atop the bar mixture and use it to spread and flatten the mixture evenly in the pan; leave the paper or plastic wrap to cover.